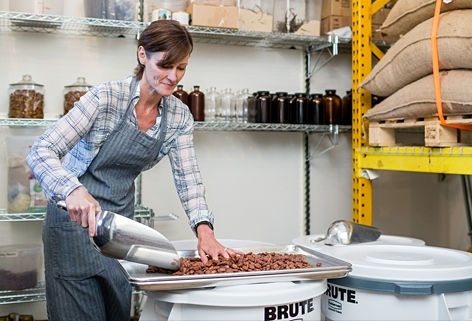 Rhonda Zender dips a spoon into the silver melanger, a machine that grinds cacao nibs, sugar and cocoa butter into a fine paste. She spins the spoon and pulls out a swirl of silky, raw cocoa to taste. She hands me the spoon, and I’m smitten by the rich and slightly fruity flavor. My friend Susan declares it heavenly. 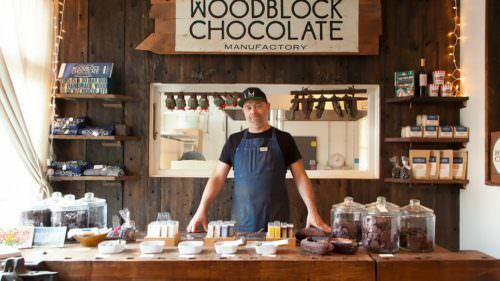 We are behind the scenes at Ranger Chocolate, where Zender is a craft chocolatier. Today she’s working with her husband, Patrick, and they take a break to show us the process of bean to bar, from roasting and grinding to aging and tempering raw, single-origin cacao sourced from three regions in Peru. While a trip to Peru always sounds enchanting, Susan and I wanted to create an adventure closer to home. We both love food, so after a few back-and-forth emails, we created a two-day taster’s tour of Southeast Portland’s emerging culinary corridor. I can’t imagine a better way to begin the day than with coffee and chocolate. Zender lights up when she talks about the farmers she and her husband met on a recent trip, and she leads us to the humidity- and temperature-controlled storage space where five and a half tons of cacao beans are stacked in burlap bags. Patrick scoops into a bag of cacao nibs, offering bits of fermented, dried, roasted and crushed cacao bean for us to taste. The flavor moves from nutty to slightly floral. Our next bite is of the 73-percent dark chocolate Tumbes — bold and velvety, with hints of citrus. “Everyone loves this chocolate,” Zender says. Before our studio tour of Ranger Chocolate, Susan and I sipped espresso at Cup & Bar, the contemporary and airy cafe shared by Trailhead Coffee Roasters and Ranger Chocolate. 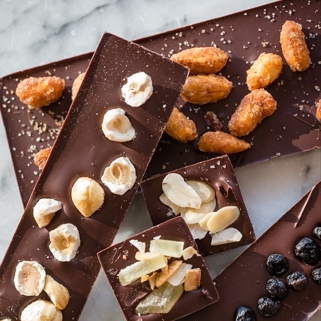 “It’s a celebration of two of our favorite things: chocolate and coffee,” Zender says. We peered through floor-to-ceiling windows of the adjacent space and watched Trailhead’s Charlie Wicker conduct a morning cupping session. Heritage Cheese at Renata, Jacobsen Salt and Ranger Chocolate photos by Leah Nash. Wicker scouts out organic beans from woman-owned cooperatives in coffee-growing regions that include Guatemala and Nicaragua. You may have spotted him cruising the streets of Portland; he pedals his coffee (up to 200 pounds at a time) around town in a beautiful, custom-designed cargo bike. Even more impressive: Wicker can also pull over to brew and serve coffee. The Cup & Bar menu creatively pairs coffee and chocolate, with classics like affogato (made with Ranger cacao-nib ice cream and espresso) and the more illustrious Dirty Charlie, a rendition of a macchiato, made with Trailhead espresso, topped with foamed milk and shaved Ranger chocolate. Quin lollipops by Maggie Hudson; Ben Jacobsen by Leah Nash; Bee Local video by Brian Kimmel (video still by Mark Gamba). Our next stop: Quin candy lab. 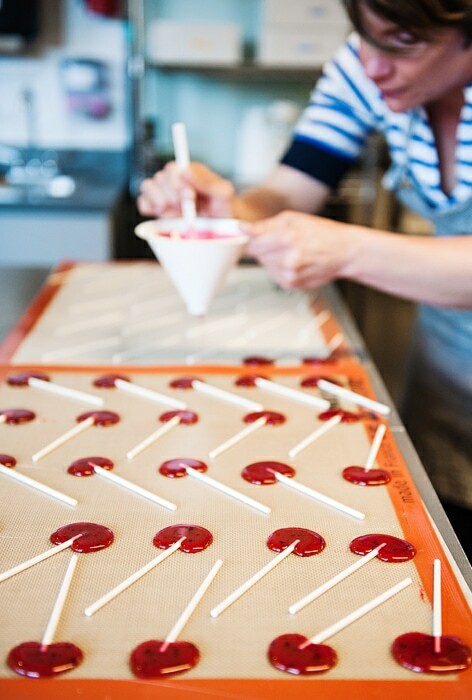 Since 2013, owner Jami Curl, a baker turned candy maker, has been enchanting candy connoisseurs with modern riffs on sweet classics like smoked-cola gumdrops and summertime-evoking strawberry lollipops. One of my favorites is Dreams Come Chew, lively, fruity bites (made with real fresh fruit and butter) in combos like watermelon lime and pineapple coconut. 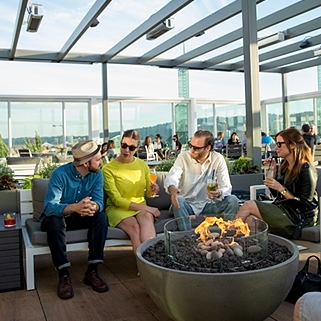 Quin hosts weekly Factory Fridays from 11a.m. to 2 p.m. and often posts about the event on their Instagram account. As we turn onto Taylor Street, we spy the Quin sign and a cool industrial space. Eight people are working in various areas, from candy making to shipping. Each step of the candy-making process is done by hand, from stirring pots of caramel on induction burners to pouring molds and packaging each piece. While there is a wrapping machine from the early 1960s, it’s mostly for glamour; the rest of the equipment used in the candy lab can be found in a home kitchen. “I think that’s as vintage as it gets!” Curl says. And it fits with the nostalgia that her candy classics elicit. Before leaving, we indulge in a sample: perfectly creamy caramel sprinkled with Jacobsen Salt Co. sea salt. 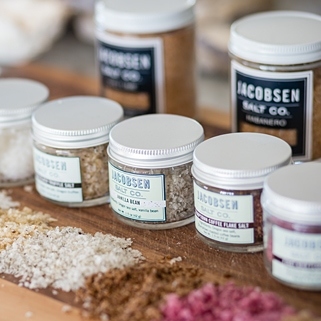 With a lingering taste of the sea on our tongues, we find our way to Jacobsen Salt Co., the urban headquarters, tasting room and retail shop for celebrated finishing salts hand-harvested from Oregon’s Netarts Bay. 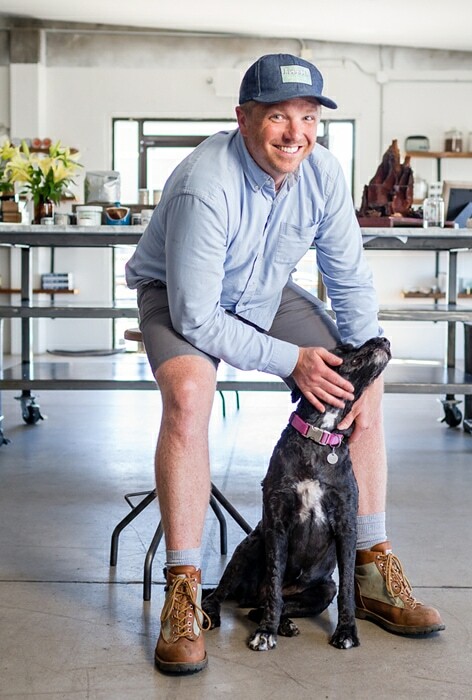 The soaring warehouse space is packed, and the first person to greet us when we walk through the door is founder and owner Ben Jacobsen. The second greeter: Lykke, his Portuguese water dog. At a marble-topped farm table, we each pluck a sliver of the pure-flake finishing salt from an oyster shell, and it smacks with the flavor of an ocean kiss. I try an earthy infusion made with Oregon truffles, and Susan pinches a taste of zesty chili-lime salt. The array of flavors makes me want to salt everything. Luckily, just as we transition to tasting the micro-batch, urban-farmed honey from Bee Local, beekeeper Damian Magista walks by wearing a T-shirt that reads “Keep Bees or Die.” As we dip a toothpick into the Willamette Valley honey, Magista explains the founding tenet of Bee Local: “We are all about capturing the terroir of a specific area.” Like in wine, this idea revolves around nurturing a taste of place. “Bees forage within a one- or two-mile radius,” says Magista, so a hive on Sauvie Island will create honey with different characteristics than a hive in Yamhill County. While we discover nuances between the Oregon High Desert and Portland Farmland honey, the most bold and memorable flavor for us both is from a partnership with chef BJ Smith of Portland’s Smokehouse 21 — smoked honey. Just drizzle it over a cheese plate or charcuterie, says Magista. I buy a few jars for an upcoming dinner, and it’s off to lunch. As we cycle to Cascade Brewing Barrel House, we realize we are on equal standing ground regarding our knowledge of sour beers: We both know very little. Thankfully, we are launching our quest with the pioneers of the Northwest-style sour-beer movement. Cascade Brewing opened in 1998 and began experimenting with sours and barrel-aged beers a decade ago. Since 2010 this second brewery location in Southeast Portland has served as a barrel-aging facility and blending house. The brewery currently holds a library collection of more than 750 French oak, Kentucky bourbon and Northwest wine barrels filled with wheats, blonds, quads, reds, browns and porters. 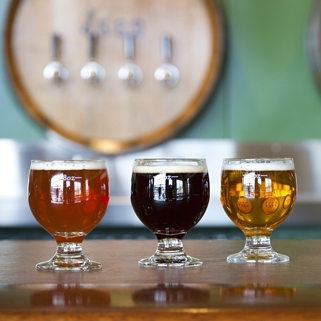 If you are seeking barrel-aged or sour beers, this is your destination. We grab seats at a barrel-top bistro table and begin with two tasters each; I opt for the Kriek, which pops with bright cherry and spices (the beer is a blend of red ales aged in oak barrels, then on fresh Bing and sour pie cherries). My second taster is a ruby-hued blackberry sour — blonde wheat beer aged for 12 months in oak, then with blackberries for another six months. Although my lips pucker with each first sip, I’m definitely intrigued by the souring and aging process, and I’m fascinated by the layers and aromatics found in this old-world, food-friendly brew. We use the menu as a guide and order our next tasters with the suggested food pairings (a collaborative effort between the brewers and chef). When the manager swings by, we ask about the two barrels behind the bar labeled “live beers.” These are weekly releases, he explains, one-of-a-kind barrels from the cellar that are tapped each Tuesday. The unpasteurized beer is poured directly from the oak barrel into your glass. “The beer continuously evolves over the course of the two weeks,” he says, which is the average time each barrel lasts. In addition to the “Tap It Tuesday” beers, the brewery features a vertical of select aged beers and 18 rotating taps. By the end of lunch, I’m a sour-beer convert. 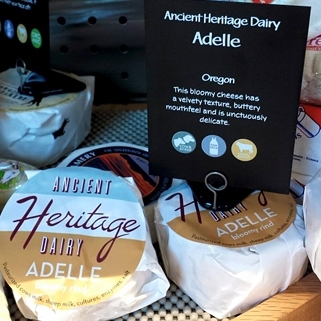 Since we are both avid cheese lovers, we skip over to the nearby Ancient Heritage Dairy, Portland’s first urban creamery. Part of the appeal here is the drama of cheesemaking. From inside Mi Piace, a gourmet food shop by day and private-dining space for Renata by night, we are able to peek into the cheese studio and watch as owner-cheesemakers Paul Obringer and his son, Hank, craft their award-winning, soft-ripened or natural-rind cheese. A second wall of windows showcases the cheese caves, and after admiring the pristine white tomes of Adelle (a soft-ripened, bloomy-rind cheese) and Willow Creek (a washed-rind, raw cow’s and sheep’s milk cheese), each stamped with a merlot-grape leaf, we decide it’s time to actually eat some cheese. There’s the option to buy rounds in the shop or to walk through a connecting doorway and into Renata for a cheese plate. Since the restaurant’s Punch Hour is about to begin, we grab bar seats and order beef-tendon cracklings and an Ancient Heritage cheese plate to share. Then we chart the course for day two. As locals, we’re heading back to our respective homes, but as I ride by the new boutique Hotel Eastlund, I yearn for an excuse to check in. The space is sleek, bright, modern and filled with avant-garde art. 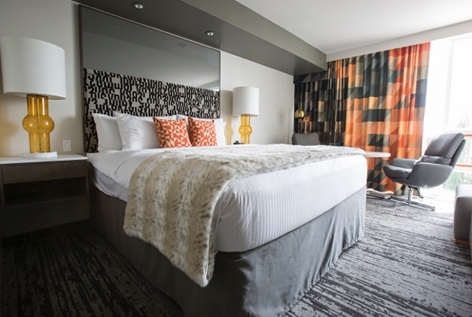 Most of the rooms feature downtown and river views. The next morning, we meet for a late brunch at Olympia Provisions, the city’s first salumeria — and now, six years later, a go-to restaurant for brunch, lunch and dinner. We are at the southeast location, and their 30,000-square-foot production facility is within walking distance. 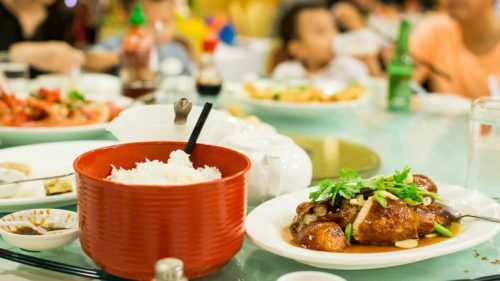 Inside the restaurant, the small space is packed with locals and out-of-towners. 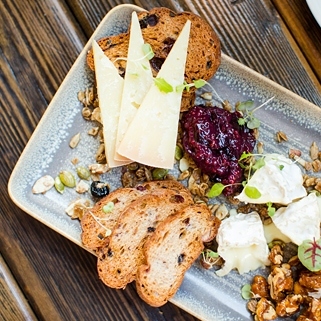 More than a few people take pictures of their food — especially the charcuterie plates, a must-order for meat lovers. We order the “chef’s choice” charcuterie and the eggs benedict, a dish I’ve been craving ever since James Beard Award-winning chef Naomi Pomeroy said it was one of her favorites in town in her “Beastly Dining Guide to Portland.” You can order it topped with sweetheart ham, spinach or smoked trout. We opt for the trout and, to be a tad dramatic, both declare the dish life-changing. We decide to end our tour exploring Portland’s urban wine scene at Coopers Hall Winery and Taproom, the first Oregon winery dedicated to keg production. Housed in a soaring 8,000-square-foot former auto-body shop, the bright space melds winery and restaurant into one. A wall of 44 taps, 36 devoted to keg-only wines, makes this a citywide destination for oenophiles. 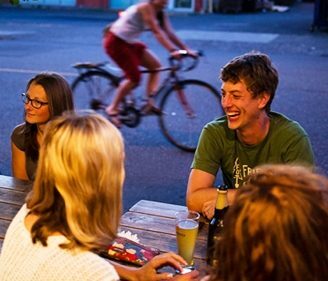 After we park our bikes near a growing collection by the door, we sit at the long banquette that separates the bar from gleaming fermentation tanks and barrel-stacked corners. In early fall, the production area will be bustling with activity — forklifts, fermenters and boot-clad winemakers. What I love about the wine menu is the option for two-ounce tasters and creating my own flight. Tonight I select a trio of rosés: one from the Applegate Valley in Southern Oregon, one from the Willamette Valley and the third from Provence. We decide to split the special — truffled rotisserie chicken — because that classic pairs well with everything. Then we each raise a glass and toast to taste of place. Cascade Brewing Barrel House by Susan Seubert; Ancient Heritage Dairy; Altabira City Tavern by John Valls; Hotel Eastlund by Jonathon House. 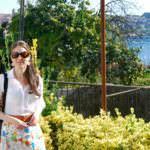 Kerry Newberry is a Portland-based writer who covers food, wine, farms and travel for a variety of publications. Her work has appeared in Forbes, Fodor’s Travel, Edible Portland, Oregon Public Broadcasting (OPB) and more.